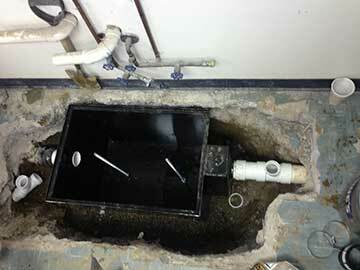 Commercial and industrial grease trap installation in Los Angeles. For Expert Grease Inceptor Installation Trust TV Plumbing. Call Us Today. Grease traps and interceptors are designed to protect the property owner and the City of Los Angeles's sewer systems from failures. The pipe work for these systems are rerouted into the grease trap to contain the grease until the unit can be cleaned and serviced. These devices do fail. We have seen cast iron devices rot out from the interior, and waste was therefore housed inside the unit in a few short years. We are replacing these with stainless steel interceptors. A laboratory can be employed for more conclusive testing and how to change the contents chemically during the cycle. We have access to numerous chemical processes to isolate and contain the issue.